Property 5: Modern decor, balcony. summer mountain view - mountain railway ticket inc.
Property 8: In the mid of the centre. 168 meters to the new village railway. All Sky HD programs. Summer 2019 mountain railway tickets included! 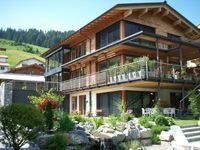 Property 27: Summer 2019 mountain railway tickets included! Flats in newly built house in Lech - Flat Omeshorn 32 square metres, 2-4 people. Property 31: Flats in newly built house in Lech - Flat Omeshorn 32 square metres, 2-4 people. The owner was very helpful from the very first time of contact. The apartment was as described in the photos etc, but we were actually pleasantly surprised that it was so well planned and modern. The sauna area was excellent. The owner provrided excellent service all week. We also enjoyed the fresh bread service every morning. The bus service was very close and worked very well. We would love to come back one day!